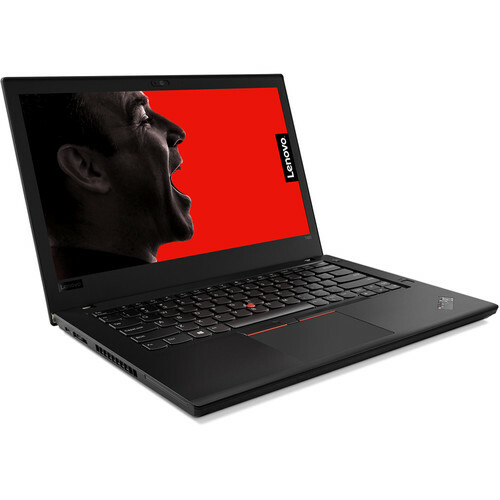 The 14" ThinkPad T480 Laptop from Lenovo is designed with the performance, security, and portability for business users. To keep up with your day-to-day tasks, it features a 24 Wh built-in battery and a 24 Wh removable battery. With this combination, you can swap out a battery when power is running low without having to turn off the system. Specs-wise, it's powered by a 1.7 GHz Intel Core i5-8350U quad-core processor, 8GB of DDR4 RAM, and a 256GB M.2 PCIe NVMe SSD. Should you need more space, you can install an additional drive as well as attach external storage solutions using its multiple USB ports. Its 14" display, driven by integrated Intel UHD graphics, features a 1920 x 1080 resolution for crisp and clear HD playback. It also has HDMI and Thunderbolt 3 outputs that you can use to connect external displays for larger viewing and enhanced multitasking. Other integrated features include 802.11ac Wi-Fi, Gigabit Ethernet, Bluetooth 4.1, a 720p webcam, a microphone, speakers, a fingerprint reader, and an audio in/out jack. The operating system installed is Windows 10 Pro. The ThinkPad T480 features Power Bridge technology, which utilizes a 23 Wh built-in battery in combination with a 23 Wh external battery. This allows you to swap out a battery and replace it with a fully charged one without having to turn your machine off. The ThinkPad T480 is equipped with a webcam, a fingerprint reader, and TPM security. With Windows Hello, you can easily log into your system with just a glance or a tap of your finger, even if you forgot your password. Meanwhile, the Kensington lock slot and TPM security keeps your device and data protected. Box Dimensions (LxWxH) 18.5 x 11.9 x 3.3"